These blondies are chewy, flavorful and packed with a mix to peanut butter and white chocolate chips. They're everything a blondie should be. They look a bit thin but it adds to the chewy texture. Sweet, slightly salty from the crust on top gives way to a soft, sticky center with pops of peanut butter and white chocolate. I'm not a big peanut butter fan in my desserts but this is something worth craving! And the best part is that it's so easy to make, you can do it any day of the week. I usually like to try to reduce the sugar in most of my recipes since my son can't really eat too much of it, but this is one exception. Brownies/Blondies and some cookies just need the sugar. It adds to the texture and once you add in the salt it doesn't taste as sweet. I know it's still in there, so a small portion will go a long way with my kids! Quality over quantity right!? So this recipe starts and ends in one bowl. Melt butter in a large microwave safe bowl. I usually microwave on high for 30 seconds then continue to microwave in 10-15 second intervals till its melted. Go at it slow because butter exploding in your microwave is the worst to clean! Trust me.... Once the butter is melted, add in the brown sugar and stir with a wooden spoon till smooth. Then mix in the egg, vanilla extract, and salt. Finally add in the flour and using all your arm strength (it took all of mine!) beat this mixture vigorously till very smooth and the batter starts to pull away from the sides of the bowl. Stir in your chips and it's done! Spread this thick batter into your 8X8 pan that's been lined with parchment. Using an offset spatula helps a lot with this! Bake at 350F for 20-25 minutes. Allow to cool slightly in the pan before cutting. 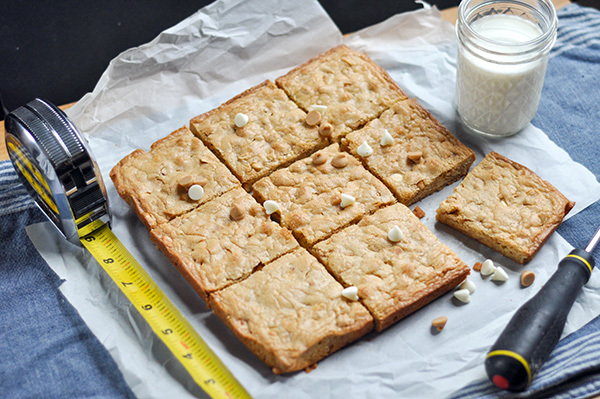 These blondies are irresistible and perfect for any man in your life! I know my men were very happy with these! Let me know what you think and as always follow me on instagram and Facebook for more fun, and delicious recipes! Heat oven to 350 degrees F. Line an 8-inch by 8-inch metal baking pan with aluminum foil or parchment paper. In a medium bowl, stir melted butter and brown sugar until blended. Add the egg, vanilla, and salt then stir vigorously until smooth. When the batter looks well blended, add the flour and stir until fully incorporated, then beat with the wooden spoon or spatula for 40 to 50 strokes. (The batter will be quite thick). Beat vigorously here. You want to see the batter pulling away from the sides of the bowl. Stir in the cookies and cream chips. Spread the batter evenly in lined pan- it was very thick so I pulled out the offset spatula to really get it into the corners. Sprinkle with sea salt if desired. Bake 20 to 25 minutes until a toothpick inserted into the middle comes out relatively clean. Cool then cut into 9 squares.